When Mark Hitchcock reflects on Skagit Valley’s unique character, one particular memory comes to mind. He was serving his first term on the board of the Skagit Conservation District when baseball season came around. He and his wife Alison joined a team of folks from the District, the Natural Resource Conservation Service, and the Farm Service Agency. Fittingly, their uniforms bore the white and black pattern of a Holstein cow. They named themselves “the Lagoons,” in an effort to draw attention to an important issue at the time: managing dairy waste in manure lagoons. Unfortunately, this resulted in an unexpected nickname from opposing teams: the L.A. Goons. In some ways, Hitchcock’s experience playing baseball reflects the best of Skagit Valley: people coming together to enjoy this place, work hard for what’s important to them, and have fun doing it. Eventually, Hitchcock earned a bachelor’s degree in forestry from the University of Washington and a master’s degree from the Yale School of Forestry and Environmental Studies. He moved to Skagit County in 1987 to start a consulting business helping private timber companies and public agencies manage their timberlands. A distant childhood memory helped draw him back to the northwest corner of the state: When visiting his grandfather in Lynden, he remembers dropping down Conway Hill and being awed by the colorful carpet of tulips covering the valley. Since moving here, his years in the forest have instilled a deep appreciation for the abundance of natural resources and how much they’ve provided for communities here and around the world. “I don’t know how many times we rebuilt San Francisco from here, but we did,” he says, referring to the city’s reliance on Northwest timber to recover from historic earthquakes and fires. 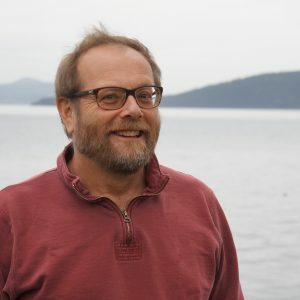 Hitchcock has served on the boards of natural resource organizations like the Skagit Conservation District and the Skagit Land Trust. Now retired, he volunteers for the Department of Natural Resources and the Samish Indian Nation helping to manage Cypress Island, which he can see from his waterfront home. Looking out at Padilla Bay from his living room, Hitchcock points out an area where he regularly sees a pair of marbled murrelets, a threatened seabird that flies inland to nest in big, old trees. The birds are also the driving force behind protective forest management regulations. “It’s nice to see that they are nearby,” he says. This is one of many stories in a series about members of the community and what the Skagit means to them, we are calling this series of interviews This Skagit Life. Skagit is a very special place, with healthy communities and spectacular natural resources. So much of what makes Skagit remarkable is the people who live, work, and play here. We realize that the health of the watershed depends on people seeking to protect that which they hold close to their hearts – without identifying what is special to each of us and then finding common areas of agreement, we will be less likely to succeed.